Crisp lines and neat edge ups. Shaping them properly just feels great, doesn’t it? Indeed: achieving a tight line or edging is a source of pride for any barber. In order to nail this, you will however need the right tools: the best hair edgers or best hair liners clippers. Let’s be honest… trimmer preferences vary from person to person. 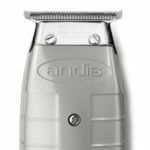 Still, I’m a big fan of the classic Andis T-Outliner as the best hair liners + all purpose cutter. Honestly, you can use any of the 4 models I’ll review. They’re perfect for all kinds of detailed work! However, their strong points differ and you have to pick what matters the most to you and your art. Often it’s also a good idea to grab, say, two of these – one as the main liner, the other one – a trusty backup machine. Any surprises? 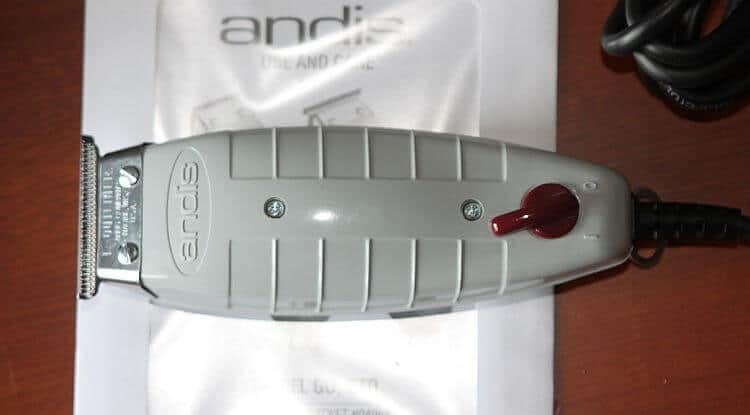 Andis’ trademark outliners are any professional’s trimmer of choice. Easy to work with due to their 5.5″ and 0.7 lbs, they are quite brilliant for hair lining. However, don’t feel limited. You can do anything from lines/edge ups to cleaning your client’s necklines or standard beard trimming. A 7200 strokes per minute electromagnetic motor will fuel the exquisite blades with extreme power. What you’ll love here is how gentle they are to dry skin. Sometimes trimmers can be a tad too sharp, thus causing irritation. While maintaining expert precision, the T-Outliner will minimize such risks. If you want to work with a smaller blade, consider the T-Outliner 2 as we mention in our Outliner review. Keep in mind that it has a square blade, instead of a T-shaped one. It’s still great as barber outliners, but it also specializes in gentle edging around the ears. The bad news? T-Outliners heat up quite a bit. In fact, they get the hottest among the models I’ve included here. Make sure you cool them and make small breaks so you don’t cause inconvenience to your clients. Still, this is the best T blade trimmer for me and I love using it. 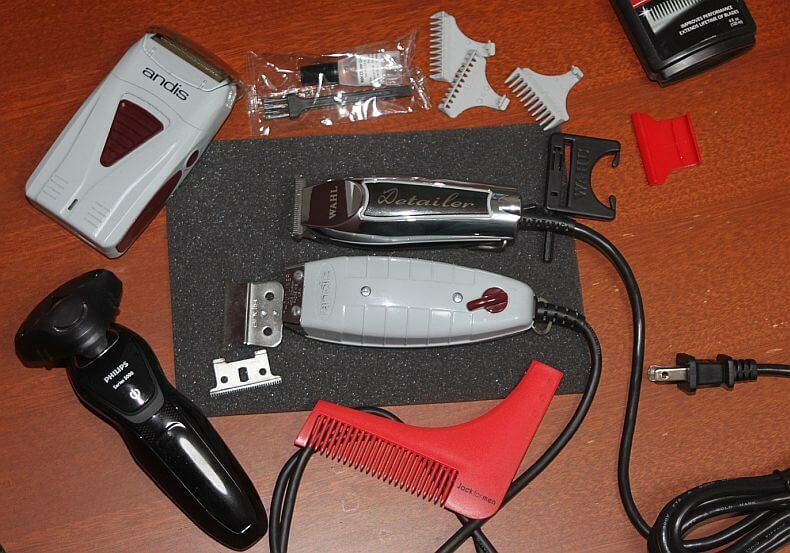 A lot of things can be said about the best hair edgers: Razor Edger vs Wahl Detailer. In my opinion, though, if it’s about edging, the 5 star Razor is a bit better. Sure, at 6.25″, it’s a bit longer than the other best hair edgers of its kind. However, its extremely slim design allows for a weight of only 0.6 lbs and great flexibility. Similar to the T-Outliner, this fella runs on an electromagnetic motor. It’s weaker than Andis’ liners. However, here you get bonus accessories: 3 T combs (1/16″ to 3/16″) and a blade setting tool, among the oil, brush and blade guard. 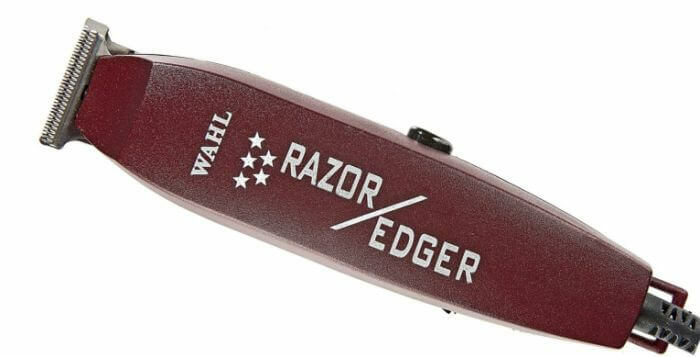 The 5 star Razor Edger is the quietest trimmer from Wahl’s product line. In fact, it soars above Andis’ models too – which is a very important plus. The weak point? While good for edge ups, this lean cutter isn’t as great as the T Liner or Detailer when it comes to other detailing work, in my opinion. A bit limited, in a way. Wahl’s shining star in the trimmer market, the #8081 Detailer comes with a wide blade and seductive body. Seriously, if it’s about model design, this is a complete winner. Chrome and burgundy beauty aside, the Detailers are also very compact. At 5″ and a mere 0.43 lbs, they’re the most convenient lining/all purpose tool you’ll find. Talk about aesthetics and functionality! Once again, you have the benefit of getting a few accessories. Three guides (1/16″, 1/8″ and 1/4″) will wait for you, along with brush, blade guard and clipper oil. The big difference is the rotary motor the Detailer runs on. It’s not as powerful as the Outliner, but it also helps the trimmer stay cooler. In terms of noise it’s on par with Andis’ most popular model, unlike the quiet Razor Edger. When it comes to hair detailing, lining, necklines and others, this machine is a total champion. That’s why it’s also included in our best barber trimmers list. There’s a catch: it trades its cooler operation and lightweight, stylish body for too sharp blades. In other words, it’s a bit more prone to irritating skin if you’re not careful. If you get the Detailer, watch out with the pressure you put when styling your clients. It’s not as forgiving as the T-Outliner among the best hairline trimmer options. The Styliner 2 won’t win design awards with its rather dull-looking 5.75″ body made of black hard plastic. It’s also a bit heavier at 0.8 lbs. Yet beneath this slightly boring appearance there’s the trademark 7200 SPM electromagnetic motor. It promises you smooth and powerful operation, ready to shape some outstanding lines. Best hair edgers? Hardly, but the Styliner II can perform some decent edge ups/lines and around-the-ear work. Its blade won’t be as crisp as a Razor Edger, though. The biggest selling point of the Styliner trimmer is its ridiculously cool operation. I’m not talking only about the blades – its body also skips on heating as much as the other models do. A very important point, as no client likes warm blades to their naked skin! Is there a catch once again? Of course. If you value zero gaps and tinkering around with how the blade is set, bad news. The Styliner II is very hard to customize compared to the other models I listed here. You need to really know what you’re doing here. Nailing a really neat lining or edge up involves some practice and dedication to your art as a barber. However, there’s some things that you’d better follow. Start detailing after you’ve finished with the other haircut work. Make sure there is no leftover hair around your client’s lining areas. The same applies for products like greases or pomades. You need everything sparkly clean. As I mentioned, blades can be pretty sharp. If you apply too much pressure, you risk skin irritation and leaving red marks on your client’s skin. Some people start from the sides, others at the middle of the hairline. For most barbers, the middle is the preferred spot. Your hair liners or edger trimmers should be put horizontally to the hairline. You’ll make vertical motions when you get to the sides. If you’re interested in other aspects of the art of barbering, remember to see if you have ticked all of the barber tools in any stylist’s must-have items. Edge ups are a special source of pride for the masterful black barbers so be sure to use only the best hair edgers and best hair liners . Check our list of the best clippers for black men’s hair if you’re interested in general haircutting advice. I like the Oster t edger best. small easy to maneuver around ears and to turn in your hand. Never gets hot, is the quietest trimmer ( doesn’t scare kids) its only flaw is in the switch that has to be replaced every couple yrs of professional use and it is a little tricky to do it yourself.